Now, with the help of the Morgridge Center for Public Service and its Badger Volunteers, this program expanded into a South Madison location for fall 2015. The UW South Madison Partnership space, located in the Villager Mall at 2312 S. Park Street, is near many community centers and schools, right off the beltline, and has accessible parking—addressing some of the barriers associated with campus-hosted events. While Badger Volunteers have supported similar programs in the past, this new partnership is unique because the Morgridge Institute for Research financially sponsored the cohort of volunteers. Steph Harrill, the director of Badger Volunteers, says that while they have plenty of willing volunteers (spring 2015 had a waitlist of about 300 people) and community partners to utilize them, they had reached funding capacity. The Discovery Outreach team needed more hands on deck to expand into the new Madison location, and it seemed a natural fit for the outreach team to sponsor a cohort of volunteers for this pilot program. Afterschool Expeditions at the South Madison Partnership Center takes place on alternating Tuesdays—Oct. 6, 20; Nov. 3, 17; and Dec. 1—from 3:30 – 5:00 p.m. Split into two 45-minute sessions (students can stay for either or both), participants will explore topics from archaeology to chemistry, astronomy to engineering. The first week’s programming focused on anthropology, with kids learning what it’s like to be a scientist out in the field. They discussed techniques used to glean information from found bones and artifacts. 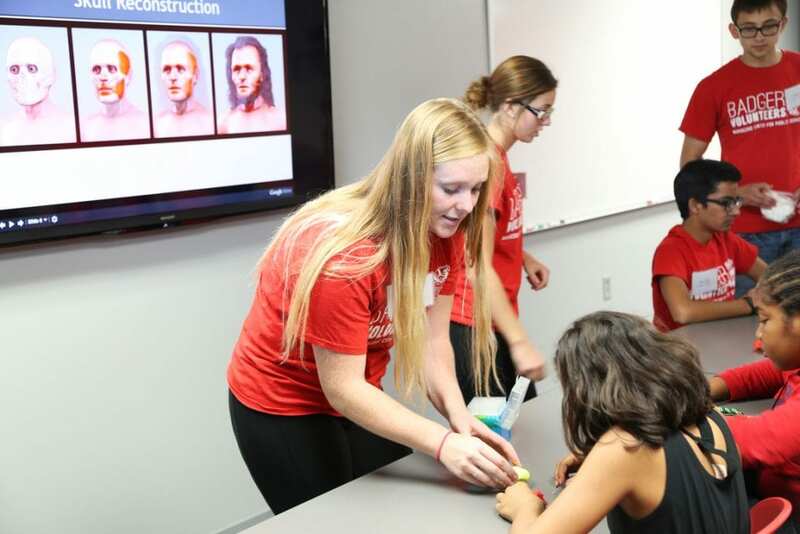 One activity used 3D-printed skulls and modeling clay to show how scientists reconstruct faces and model what individuals from the past may have looked like. Outside presenters, like from the Wisconsin Energy Institute, will also lead some activities each week. Blair says she hopes the new effort can be a catalyst for continued science engagement both at the Discovery Building and in the community. Harrill would also like to see the partnership continue and the volunteers utilized beyond the fall semester. 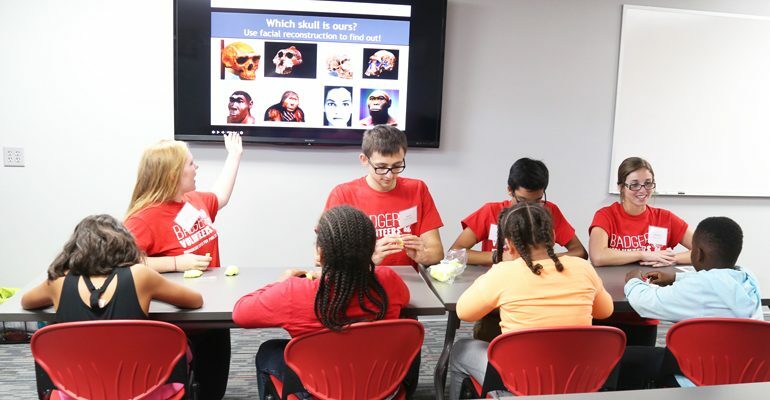 Participants learned about the steps of facial reconstruction-- scientists often start with a skull, then add muscle, skin and hair to create a model. 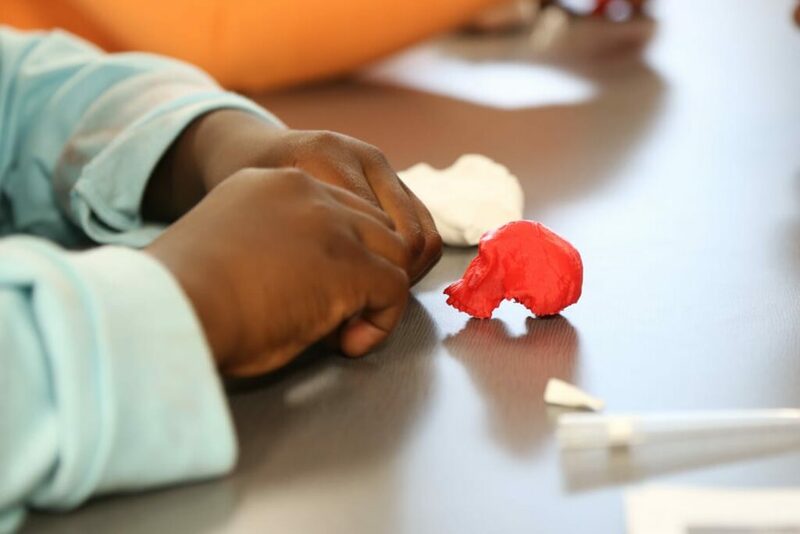 In this activity, kids used 3D printed skulls and modeling clay to try the process for themselves. A 3D printed skull used for an activity on anthropology at the Oct. 6 Afterschool Expeditions, held at the UW South Madison Partnership.